I couldn't resist, I had to put Cassidy's swimsuit on!! How cute! I am just so excited about Spring and Summer clothes for her! She is just so cute. So, I am looking forward to a quite evening tonight. It can not come soon enough! Cassidy got her first swimsuit today, a bikini. Gap was sold out of the one I really wanted but Old Navy's was a close second!!! Gap has some really adorable baby clothes right now! Here are a few I wish I could have! Jaden, Cassidy, and I ventured to the mall today for some exercise and some window shopping. I was also looking for a dress for Easter! Jaden said he wanted a cookie at the mall with icing and sprinkles. So, when we came upon Blondie's Cookies, he was so excited! And guess what? They had cookies with icing and sprinkles. Can you believe, $2.19 for one little cookie!!!!!!!! I should get into that business! They have to be making so much profit! Then, off we went, looking at clothes for all of us and just plain looking around. Then, Jaden wanted to go to the bookstore but I took him to get his haircut first. He has been telling me he didn't want to get his hair cut, but it was time! He screamed for over 5 minutes, kicking his feet and having the biggest FIT I have ever seen him have! Then, he calmed down and ended up liking his hair being cut! KIDS!!!!!! So, here is the new Jaden! Since my course one Wilton classes have ended and the second course hasn't started, I figured I should experiment with icings and cakes! So, today is a chocolate cake with buttercream. I got a new recipe for buttercream and I am loving it! I really hope one day soon someone will want to purchase a cake!!! I would love to start making money on these things! I actually got an order, but it isn't until June. Who knows what will happen between then and now! Today is just another day for the kids. Cassidy is loving drinking out of a sippy cup and Jaden is watching some tv. We really need to get outside sometime today. Maybe Jeff will take them out when he gets home. Another nice day and Jeff is off! Several times we find ourselves saying, "It always rains when you're off of work!!". But not the past couple of days. Jeff's days off have been beautiful. I am so happy. Jaden has spent so much time outside. He loves it! Here are some pictures of our time today at the playground! We are so lucky to have a nice school near us with a very clean playground. I thought making cupcakes would be fun, but it has caused so much! I can't stop eating them. Well, it's not like I have eaten a bunch, just two. But one is too many!!!! They are really good and they make for good comfort food. Also, Jaden won't stop asking for one. He talked about them all day yesterday and woke up today asking for one! Maybe I won't make these anymore! I thought about making some for Easter, but maybe I won't! Cassidy is growing so fast. I can't believe she is going to be one in a little over a month. I am so excited!!!!! I can't wait. Little girl birthdays are so fun! It is very fun to plan. I was going to just have a small party at our house, but I decided to have it a little bit bigger and at the park! I hope it will be a lot of fun. I made cupcakes for the fam today! Jaden loves them!! He made a huge mess, but so did I when I made them, so I didn't get upset! I just felt like making some "Spring" cupcakes. I thought they turned out okay. I hope everyone else is enjoying some Spring treats! Well, yesterday was a beautiful day but I was sick!! I didn't really get to enjoy it. Jaden and Cassidy did get to play outside and Jaden even got a blizzard last night! I think he really enjoyed that. The kids are taking a nap now and I thought I would take this opportunity to post some pictures! What was really cool was that he already has a little one that looks just like it and he said "Look, it is chicken's mommy!!". I had to get it for him once he said that! I have Cassidy's invitations all finished and they will be sealed and sent soon! It was fun making them. I can't wait for everyone to get them. If you need directions, please email us or call. I hope everyone is having a good week and I will post some more cute pictures soon!!! Tomorrow is Jeff's day off so I am hoping to get some stuff done! I had a great weekend. It all started off with St. Patrick's Day! It was so fun. A leprechaun visited our house the night before and did all kinds of things. He colored our milk and applesauce green! He also left Jaden a shamrock cookie cutter and lined all of our shoes up with chocolate coins in them! How cool is that! He was thrilled! We made shamrock cookies and they were very good! I also started on Cassidy's birthday invitations. I have them almost finished! They are so cute! Yesterday, Jaden, Jeff, and Cassidy took me to the nearest outlet mall for my birthday (that is coming up! )and let me buy some clothes. I couldn't help but buy a few clothes for the kids. I did buy myself a lot of new shirts! I hardly have any since I have lost so much weight. I did most of my shopping at the Gap outlet. I love that store! They also bought me the Wilton 2007 yearbook. That is a great book! It is really inspiring me to make more cakes! They also took me to Panera Bread for supper. That is my favorite restaurant! I had a mushroom pizza, it was very good! We had a great time! I will post some more pictures later! Shopping for kids clothing is so expensive, so I went to Once Upon a Child today. 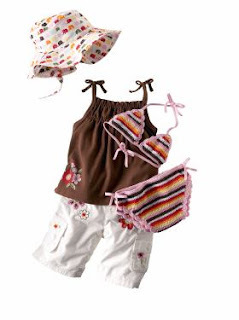 I spent a lot but only got a few outfits for Cassidy and a shirt for Jaden. I did get Cassidy's Easter shoes, but I haven't gotten her dress yet, isn't that funny! Now I have to match the dress with the shoes. I can't wait to get her all dressed up! Jeff took the cake I made to work today. Lord knows we don't need it in our house!!! It did turn out pretty good for it falling apart when I stacked them. I had to glue the cake together with buttercream. It worked though. I am hoping I can get good enough at this to start selling my cakes. I would love to make cakes for other people!! I don't know when course 2 will start, but I am hoping soon! Here is my final cake from Wilton Course One! I can't wait to start Course 2!!!! So, we ventured to the license branch today. I always dread going there. We had to get the license plates renewed. I wanted a personalized plate, but we have to put a request in a year before. So, I will get my personalized plate next year! The kids waited patiently and it turned out not being as stressful as usual! I have Clay Aiken's concert dates. Well, almost. He has 12 of them up on the fan club site and will be adding 8 more. So far, there isn't going to be one in Indiana. So, we might be heading to Columbus in July. I really can't wait! He is going to be playing with an orchestra again! Clay will be performing approximately 20 orchestra dates across the U.S. this summer in July and August. The on sale and fan club presale information is just now starting to come together but we wanted to give you as much information as we can as soon as possible. We WILL be doing fan club presales on as many dates as allowed and will post that and the public onsale information as soon as it is available. Below are the dates that are confirmed so far. The rest of the dates should be confirmed by the end of this week, so keep checking back. We grilled out some corn, hot dogs, and hamburgers today. That was fun! I still can't believe this weather we are having. Cassidy ended up with a sunburn yesterday! Poor thing! 8o degrees in March! Can you believe it! We took advantage of it and went to the park and for a walk!! It is so nice outside! Here are some pics! Nothing cuter than baby feet in sandals!!! It has been super nice outside. I took the kids out to play yesterday, and we also played today! It was so fun! Cassidy loves swinging and riding in the wagon. Jaden loves playing soccer and swinging! I would love to get him a trampoline soon. They are so expensive, I was hoping to find a used one somewhere! Here are some cute pictures from the past two days! I finished my second cake last night. It turned out okay. I wish I could have done the shells better. I am going to keep practicing!!! Does everyone remember the post awhile back with the cute pink and green bunny bracelet? Well, I have looked everywhere and searched online for those bunny beads. I can't find them anywhere! The lady isn't selling them right now, but I emailed her in hopes that she would relist it. I really want it for Cassidy for Easter. When I emailed her, I noticed she is from England, so I probably couldn't get those beads here. What a bummer!!!!! I have class is about 30 minutes. We are making a clown cake tonight. I will be sure to post it!!! Wish me luck! Look at the Big Girl! Most of you know that I am a huge Clay Aiken fan! I am not ashamed to admit it! I went to his concert Summer of 2005 and also got to attend his Christmas concert in December of 2006. He started the Christmas tour on December 1st and we went to the December 2nd concert. At the first concert he had missed the last note of his last song! A tragedy really! The next night, he sang it beautifully. I was watching it again today and decided I needed to share it with everyone! This weekend flew by! Jaden had his last basketball game on Saturday. It was a makeup day for one of the days it snowed. He had a good time. He didn't make any baskets, but he tried. He didn't play his best, but I wanted him to have fun. Now, it is time for soccer. I don't know when that starts, but I will let everyone know. He is VERY excited about that. Jeff ended up working all day, so I took the kids out shopping. We didn't really buy anything, we just looked at some toys. There are some pretty cool toys out now. Jaden really liked the wrestling guys, but I don't think I am going to get him into that!!! Cassidy likes everything. She loves toys!! I wish I could buy her everything! Here are some cute pictures from this weekend. ATTENTION FAMILY AND CLOSE FRIENDS!! I am in the middle of planning Cassidy's party and we need to know how many people will be coming. I would like to get a room booked, but I need to have the number of people. Please respond to this blog post or email me at: JandCsmom1@gmail.com. I would like to get this done as soon as possible, so please let me know if you would like to come. It will be May 5, 2007 at 12:00pm. Well, sort of. This is my first cake during my Wilton cake course. Pretty cool. I didn't realize how much work goes into a cake. This actually took a long time. If you think about making the cake, making the icing, coloring all of the icing, putting it all into bags with different tips, putting the cake onto a stable surface, icing the cake, decorating the cake, and finally cleaning up all of that mess!!!! This was all especially long for me tonight because I had to haul all of it to class and decorate it there. It was worth it though. I am proud of myself!!! We decided it would be better to have Cassidy's party on Saturday, which would be May 5th!! I wanted to let everyone know! If you are planning on coming and staying the night, we can help you find a good motel, just ask! We have decided Cassidy's birthday party will be on May 6, 2007. I am not sure of a time yet, but I wanted to give everyone a heads up! I will be sending out invitations around the middle of April. Maddy just loves it!!! She lays in it almost all day! I can't believe it! I am sure she is wondering why it took me over 6 years to buy her her own bed!!!!! She absolutely loves, and I do too! She doesn't try to get on our bed anymore!!! !